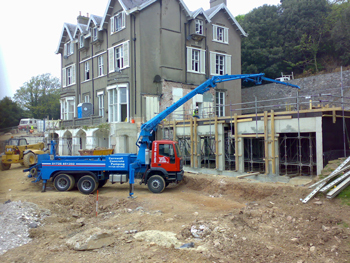 Cornwall Concrete Pumping, Mortar and Screeds. Mortars and concrete are the fundamental components of most of the construction industry in the United Kingdon. What are Mortars and Screeds? For everyday definition purposes, a concrete is a cementitious material containing aggregates with dimensions greater than 5 mm, whereas a mortar is a cementitious material containing aggregates with dimensions less than 5mm. 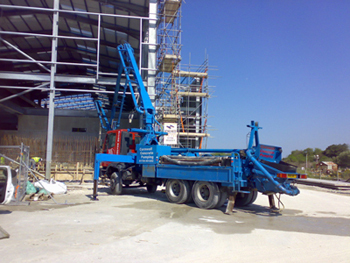 At Cornwall Concrete Pumping we offer pumping services for concrete and mortar. Mortars are used throughout the construction industry for a variety of purposes, including brick-laying, bedding of small concrete component such as ridge tiles, and for the sealing of certain types of paving. Screeding is a method of constructing a well profiled bedding layer that flags or bricks or any other, regular thickness pavings can be directly laid onto with no further levelling. A screeded bed is typically established approximately 5-10mm high, and the pavings then compacted down to the correct level.